Who uses NASA Earth science data? Dr. Pinki Mondal, to study the effects of climate change on agricultural systems and communities. Dr. Pinki Mondal in her CIESIN office. On the computer screen is a map showing trends in MODIS Normalized Difference Vegetation Index (NDVI) for the 2000-2016 wet season/monsoon in South Asia/India. Image by Dr. Chandranath Basak. Research interests: Human-environment interactions with a specific focus on the sustainability of agricultural ecosystems, agricultural sensitivity to climate variability, adaptation strategies for smallholder farms, and the effects of national-level policies on forestry and conservation. Research highlights: Counting the residents of the second most populous nation in the world is a daunting task, but one India has undertaken every 10 years since the late 1800s (as a British colony until 1947, then as an independent nation). The numbers from the 2011 Indian census reveal that almost 70% of the nation’s more than 1.2 billion inhabitants live in rural areas, with a majority of these rural residents engaged in agriculture. While the Census of India collects data at ground level showing where the population lives, instruments aboard Earth observing satellites constantly collect data showing how land is used. These remotely-sensed data are a foundation of Dr. Pinki Mondal’s studies into the sustainability of agricultural systems and the impacts of climate variability on agriculture in South Asia. Dr. Mondal currently conducts her research at CIESIN, which is the location of NASA’s Socioeconomic Data and Applications Center (SEDAC). SEDAC is an Earth Observing System Data and Information System (EOSDIS) Distributed Active Archive Center (DAAC), and supports the integration of socioeconomic and Earth science data in order to serve as an information gateway between the Earth sciences and social sciences. Satellite data can reveal a lot about the socioeconomic impacts of urbanization and environmental change, and help researchers more easily identify changes in landscape patterns across a wide range of spatial (local, regional, or continental) and temporal (week, month, or year) scales. For example, nighttime lights imagery from the Visible Infrared Imaging Radiometer Suite (VIIRS) make it easy to see the spread of urbanization into previously rural areas through changes in the density of human-added lights. Vegetation indices created from data collected by the Moderate Resolution Imaging Spectroradiometer (MODIS) aboard the Terra and Aqua satellites and by instruments aboard the joint NASA/U.S. Geological Survey’s (USGS) Landsat series of satellites enable researchers to more easily analyze changes in vegetation and spot patterns across entire continents. As Dr. Mondal notes, her research would be impossible without NASA Earth science data. Three ways of looking at vegetation in India using Normalized Difference Vegetation Index (NDVI) data. NDVI is a measure of the greenness and health of vegetation. Left image: Terra/MODIS (go.nasa.gov/2GZJCtT). Center image: Terra/Multi-angle Imaging SpectroRadiometer (MISR) (go.nasa.gov/2GZSRdg). Right image: Combined Landsat 7 Enhanced Thematic Mapper Plus (ETM+) and Landsat 5 Thematic Mapper (TM) instrument data produced by the Web Enabled Landsat Data (WELD) project (go.nasa.gov/2JIhyNd). Darker green colors (MODIS and Landsat images) and yellow/red pixels (MISR image) indicate areas of healthier, more dense vegetation. Images accessed on April 13, 2018, and courtesy of NASA Worldview. Dr. Mondal’s current research focuses on developing geospatial methods for monitoring smallholder agricultural systems in tropical countries. A “smallholder farm” generally is defined by both its physical size and its economic production, both of which are often small relative to other farms in a similar region. As a result, smallholder farmers can be impacted more significantly by changes in production caused by environmental factors including drought, flooding, and invasive species or by social factors like urbanization or state policies. 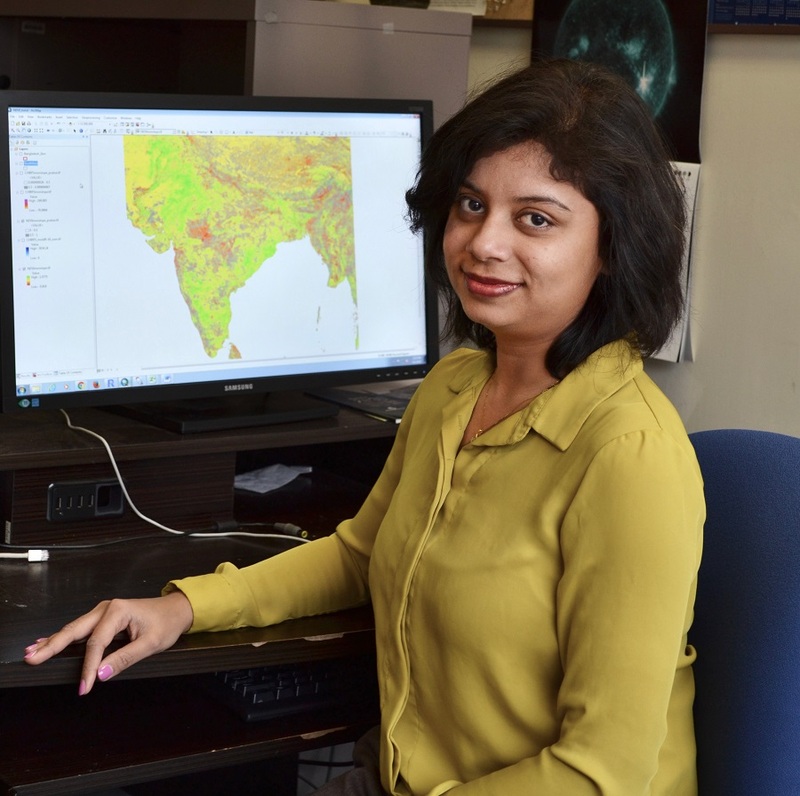 In her research, Dr. Mondal uses microwave satellite data, Synthetic Aperture Radar (SAR) data (such as data from the European Space Agency’s Sentinel satellites), and high-resolution optical satellite data (such as from Landsat and Sentinel-2). As Dr. Mondal notes, climate changes are expected to lead to significant fluctuations in crop yields and contribute to concerns about food security of the growing Indian population. She uses multi-platform satellite time-series data from MODIS, Landsat, and the joint NASA/Japan Aerospace Exploration Agency Tropical Rainfall Measuring Mission (TRMM),operational 1997-2015; along with district-level Indian census data for irrigation, dominant crop type, crop yield, and socioeconomic status to explore factors associated with changing crop covers. Dr. Mondal also is interested in developing machine-learning algorithms that can convert socioeconomic and environmental data into geographic information system (GIS)-ready formats. The socioeconomic data used by Dr. Mondal are often obtained from national census or large-scale surveys and have millions of records at the finest administrative levels that require big data analysis. She integrates these data with satellite imagery to understand potential adaptation strategies of agricultural systems to climate change. Her collaborative research on agricultural sensitivity to weather and climate variability in India has led to several interesting research findings. Along with the critical importance of daytime temperature to winter crops, she found that the sensitivity of crop productivity to climate variability is location-specific, and due primarily to differences in cropping practices throughout the year and irrigation access during the dry season. In addition, the sensitivity of crop productivity to precipitation depends on the irrigation source. For example, a longer wet season (monsoon) followed by higher temperatures in winter or a late and dry monsoon can severely limit the water available through surface irrigation, such as canals. These canals are a common irrigation source in Indian smallholder agricultural systems, so impacts to the water in these canals through changes in monsoon intensity or timing can significantly impact smallholder agricultural production. Changes in annual winter cropped area in India from 2001 (left image) and 2016 (right image). Darker green indicates a higher percentage of winter cropped area. Image credit: Jain, M., Mondal, P., Galford, G.L., Fiske, G. & DeFries, R.S. (2017). India Annual Winter Cropped Area, 2001-2016. Palisades, NY: NASA SEDAC [DOI: 10.7927/H47D2S3W]. Accessed April 13, 2018. Dr. Mondal points out that winter wheat, a staple and an important winter crop in India, requires timely irrigation. In research looking at strategies smallholder farmers can consider in dealing with the impacts of water and climate variability on the production of winter wheat and other winter crops, Dr. Mondal and her colleagues found that pulses, that is, crops harvested solely for their dry seed (such as dried beans, chickpeas, lentils, and peas), can be a potential alternative winter crop in the right type of soil. Other adaptation strategies include switching to crops less sensitive to heat, shifting the planting date for winter crops to avoid higher temperatures during the late-season grain maturing stage, and investing in research to develop early-maturing varieties of winter crops. The combination of remotely-sensed data with census data provides a powerful tool for socioeconomic research and the application of this research to regions and economies that can be sensitive to climate variability. The research by Dr. Mondal and her colleagues seeks to provide a range of agricultural strategies so that the residents of these vulnerable areas can best prepare for potential future climate and environmental changes. Mondal, P., Trzaska, S. & de Sherbinin, A. (2018). “Landsat-derived estimates of mangroves in the Sierra Leone Coastal Landscape Complex during 1990-2016.” Sensors, 18(1): 12 [http://doi.org/10.3390/s18010012]. Jain, M., Mondal, P., Galford, G., Fiske, G. & DeFries, R. (2017). “An Automated Approach to Map Winter Cropped Area of Smallholder Farms across Large Scales Using MODIS Imagery.” Remote Sensing, 9(6): 566 [http://doi.org/10.3390/rs9060566]. Mondal, P., Jain, M., Zukowski, M., Galford, G. & DeFries, R. (2016). “Quantifying fluctuations in winter cropped area in the Central Indian Highlands.” Regional Environmental Change, 16: 69-82 [http://doi.org/10.1007/s10113-016-0946-y]. Mondal, P., Jain, M., DeFries, R., Galford, G. & Small, C. (2015). “Sensitivity of crop cover to climate variability: Insights from two Indian agro-ecoregions.” Journal of Environmental Management, 148: 21-30 [http://doi.org/10.1016/j.jenvman.2014.02.026]. Mondal, P., Jain, M., Robertson, A., Galford, G., Small, C. & DeFries, R. (2014). “Winter crop sensitivity to inter-annual climate variability in central India.” Climatic Change, 126: 61-76 [http://doi.org/10.1007/s10584-014-1216-y].